Everyone loves to have storage space. Regardless of the size of your home or business, having a storage space is great for many people. Having an Amish garden shed can resolve many of those issues and more from increasing the value of your property to help you sort that 90s sports equipment you can’t imaging parting ways with, there are many great reasons to buy an Amish shed or garage. Have a look at our list below and find our top reasons to invest in our Amish sheds and garages here at All Amish Structures. Storage is the most obvious reasons of having an Amish shed. When you have extra space in your garden it is easily filled with garden equipment, motorcycles, bikes, barbeques and all other oddly shaped objects that are otherwise hard to put away. Having them protected under one of our Amish sheds or garages will make life much easier for you. Having an extra storage room in your house will make its value go up. If you are thinking of selling your home in Easton, PA one day, always make sure you invest in an Amish shed or garage for your property with good keeping, restoring and adding extras here and there. When you transfer all your oddly shaped object to your Amish shed or garage, you free up much needed space in your home as well as in your garage. By doing so, your garage can be used for its real purpose, while your living space will appear much tidier and easily enjoyable for you and your family. A Amish shed or garage can also be a great space for activities. 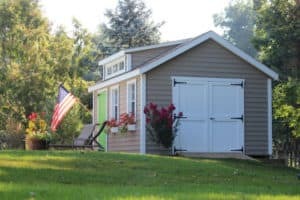 If you need a man cave to hide in or a space that is dedicated to arts and crafts or even a small gym, look no further than a Amish shed or garage. Turn your storage shed into a summerhouse and add an extra room to your property, whether you have many guests coming and going or you want to give your children some privacy when they come and visit, a summer house is a great way to make everyone happy. Still undecided about adding an Amish shed or custom garage to your home? Contact us today or visit one of our two showrooms located in PA and NJ.